When you’ve got room for 33 rounds in your pistol you’re certain to hit your target, no matter how eventually! This 33 round 9mm magazine is made by Glock itself, so you’re assured optimal functionality whether you should implement with a G17, G19, G26, or G34 pistol. It will also work well in a carbine such as the Kel-Tec SUB-2000, and in an AR-15 too provided you’ve the right mag block for it. 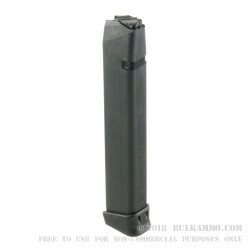 This drop-free double stack magazine is made of a hardened steel insert encased in durable polymer, so it can endure whatever reasonable abuse you might subject it to without deforming. Its feed lips are also made of steel, so you can always count on its reliable functionality, and the numbered witness holes in its back give you immediate reference to how many cartridges you’ve left at your disposal. This enormous magazine is a great option if you prefer keeping your Glock at your side for home defense, or just for impressively long turns at the range stall. And so long as you’re here, check out our great deals on a variety of 9mm ammunition -- a magazine this size can certainly gobble up ammo!